What are the latest developments in the U.S. gun control controversy? The gun control controversy has resurfaced in the aftermath of incidents of highly publicized indiscriminate deadly mass shootings. 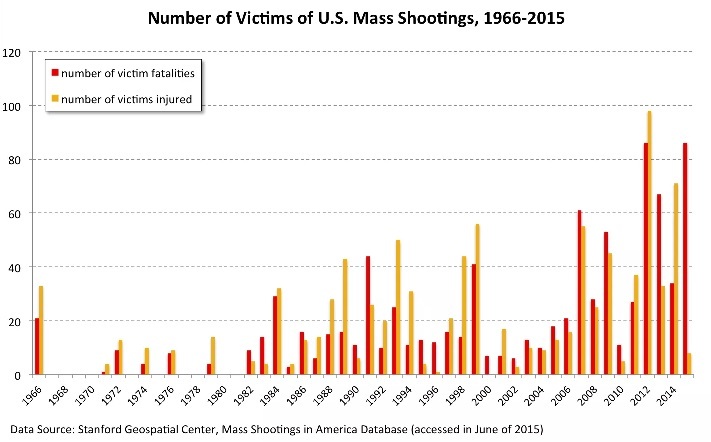 Many of these shootings have involved the use of automatic weapons. Such incidents were extremely rare prior to the mid 1980s but have become alarmingly frequent since then. The reasons for this epidemic are poorly understood. It remains to be seen whether renewed gun control fervor will continue since gun control has not been a politically popular issue in recent years. Fewer Americans are supportive of gun control in general and handgun control in particular. While the issue has dropped in overall public concern, it remains what politicians consider a "wedge issue" as many opponents of gun control are passionate about their right to unfettered gun ownership and may make voting decisions on this issue alone. The percentage of Americans who consider "gun control" as an important issue has been low until it again rose in the aftermath of these shootings. What is the present level of gun control in the United States? Like many other aspects of public policy, gun control is a matter of federal, state and even local legislation. Under two Supreme Court rulings which were issued in 2008 and 2010, there are constitutional limits to gun control. Based on the second Amendment, these rulings invalidated laws in Washington D.C. and Chicago which had banned ownership of handguns. Gun control has been an issue for many decades because of the fact that the gun death rate in the United States far exceeds the rate in other developed countries. The first major gun control initiative was enacted by Congress in 1934 which regulated the sale of fully automatic firearms like machine guns. This legislation was followed in 1938 by a new federal law which required gun sellers to be licensed and which prohibited persons convicted of violent felonies from purchasing guns. No further legislation was passed by Congress until 1968. The Gun Control Act of 1968 regulated imported guns, expanded gun-dealer licensing requirements, and expanded the list of persons not eligible to purchase guns to include persons convicted of any non-business related felony, minors, persons found to be mentally incompetent, and users of illegal drugs. In 1986, federal legislation established mandatory penalties for the use of a gun in the commission of a federal crime. Also prohibited were "cop killer" bullets capable of penetrating bulletproof clothing. In 1990, legislation was passed which banned the manufacturing and importation of semi-automatic assault weapons. In 1994, Congress passed what has been regarded as the most comprehensive effort at national gun control. The "Brady Bill" named for the press aide who was seriously injured in the assassination attempt on President Reagan imposed a five day waiting period for purchasers of handguns and required local law enforcement authorities to conduct background checks of all purchasers. The Supreme Court held that the background check provision was unconstitutional because it infringed on state's rights. Presently, the law has been revised so that the background check is instantly accomplished by gun dealers through a national computer system and there is no longer a waiting period. Also in 1994, Congress passed a ban on certain types of assault weapons. This ban expired in 2004. By a narrow margin , the Senate voted to extend the ban but the House did not take action and the ban was allowed to expire. Efforts to revive the ban have been unsuccessful. Many states have passed legislation making it a crime to leave a loaded weapon within easy access of a minor. About seven states prohibit concealed weapons. Many others require an individual to show a need prior to obtaining a license to carry a concealed weapon. In over half the states, all non-felons are able to obtain licenses to carry concealed weapons. Only one state, Vermont, has no licensing or permit requirement. Under federal law, minors under 18 are prohibited from possessing guns and minor under 21 are prohibited from purchasing guns from dealers. However, unless regulated by state law, minors 18 and over are able to freely purchase weapons through private sales. Currently 21 states either prohibit or substantially regulate this secondary market for minors. Over twenty states regulate secondary sales through registration or licensing requirements. In the states that have no such regulation, the secondary market allows minors and criminals to easily obtain weapons. This is the so-called "gun show" loophole. In 1989, California was the first state to ban certain types of automatic weapons. More extensive bans have been enacted in New Jersey, Hawaii, Connecticut and Maryland. Many purchasers (felons and minors) have circumvented federal law by purchasing firearms from individuals who have legally made bulk purchases of handguns. Four states (South Carolina, Virginia, Maryland, and California) have laws that limit legal purchases of handguns to one a month per buyer. Ban on "Saturday Night Specials" and other "junk guns"
These are small, easily concealed lightweight guns which are unreliable but have appeal to criminals because of their portability. A minority of states have laws which regulate the purchase and use of these weapons. Additionally, local laws in a number of cities outlaw the possession of these weapons. The majority of states have laws which prohibit local authorities from passing local gun control ordinances. These "preemption" laws have been supported by the opponents of gun control. Officials in cities which are able to pass such ordinances, such as New York, credit their existence to a dramatic reduction in violent crime. Although background checks are no longer necessary under federal law, about half the states still use state data in addition to federal data to conduct background checks prior to issuing a handgun permit. Eleven of these states impose waiting periods as well. According to an analysis by the Washington Post, by 2013 there were more guns than people in the United States, 357 million. Although it appears that the number of households owning guns has decreased , there has been a substantial increase in amount of guns present in the households that have them . Slightly over a third of all guns are handguns. How effective have gun control efforts been? Gun control has clearly been unsuccessful in reducing the overall amount of guns. Although less than 1% of gun applications have been denied since the enactment of the Brady bill, most of the denials have kept guns from felons. 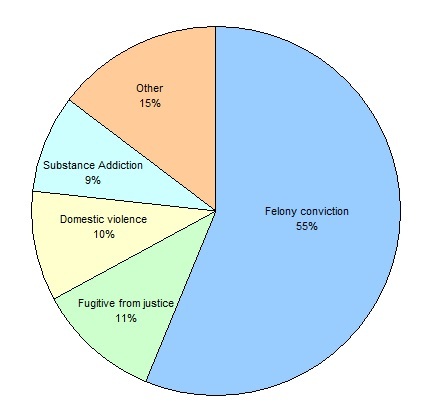 But felons who want guns are able to use the secondary market in most states. Felons who live in a state that regulates the secondary market can easily use the secondary market in a neighboring state. Guns are used in the majority of homicides and because there there has been a reduction in the homicide rate since the 1990s , there has been a reduction in gun homicides. But the lower homicide rate is probably more associated with reduction of crime in general than with the institution of gun control. There is not a clear co-relation between homicide rate and the states that have more stringent gun regulation. On the other hand, more gun deaths are the result of suicide than homicide and there is a very clear co-relation between the suicide rate , the gun suicide rate and the percentage of suicides due to guns among the states with and without strong gun regulation. How do other countries regulate guns? Almost all major countries have systems for registration of firearms. 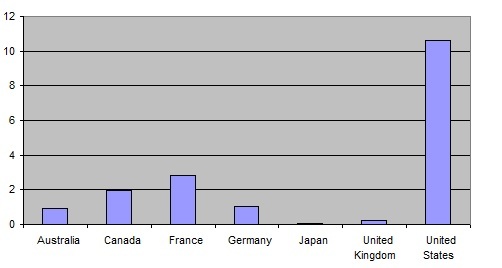 Most major countries do permit the ownership of handguns. Many countries ban ownership of certain types of weapons although some have no restrictions. The United States is the world leader in gun ownership and it has a correspondingly high homicide rate. But there is not a clear relationship between gun ownership and the homicide rate. Countries such as Canada have a significant degree of gun ownership yet a low rate of homicide. How do Democrats and Republicans differ on gun control? Although Democrats tend to support gun control proposals and Republicans do not, the relative unimportance of the issue to most Americans has resulted in a paucity of successful gun control leglisation at any level in the past decade. Moreover, the opposition of gun proponents to all forms of gun control has remained fierce. Gun control opponents raise far more money than do gun control advocates. In 1999 the Senate narrowly voted to regulate gun shows and more substantially supported a measure for trigger locks but no action was taken by the House with respect to either proposal. In April 2004, the Senate again voted for handgun locks but the House did not consider the measure and the issue has not recently been resurrected.